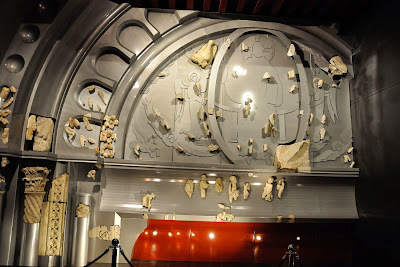 The Musée Ochier in Cluny has the great portal of Cluny III on display, or what is left of it. And that is not much, considering that the whole portal was blown up in 1810. 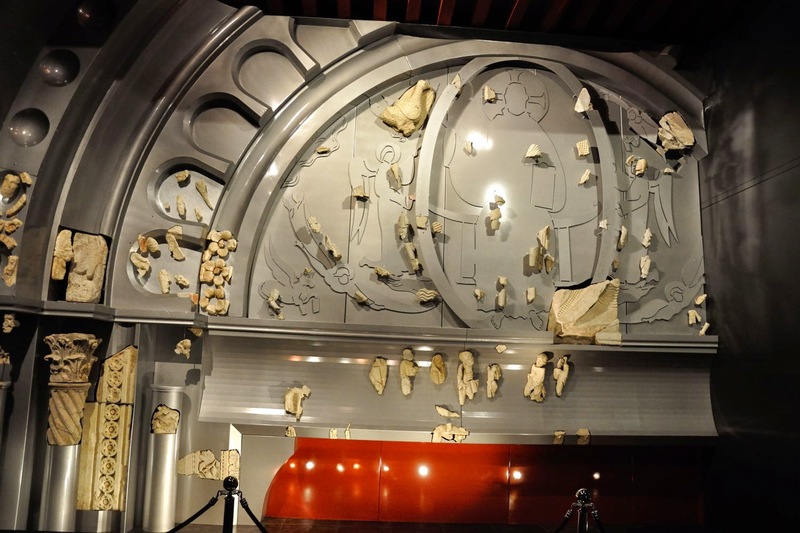 One of the best preserved pieces is the eagle, symbol of Saint John the Evangelist. 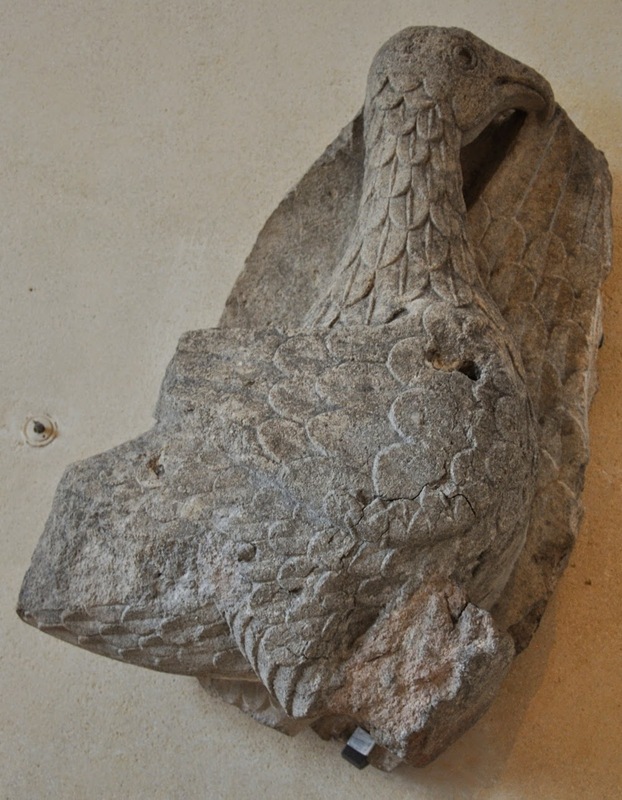 There is nothing on the wall, at least as far as I recall, which points to the fact that this eagle might be a copy, and hence I have always believed that this eagle once was physically part of the narthex of Cluny III. Until one day I encountered a very similar eagle in the Louvre in Paris, albeit with tiny differences. The stone in the louvre looks more weathered, and the top bit of the broken off part at the underside of the eagle shows a V-shaped scratch which has a slightly different shape from the one in Cluny. 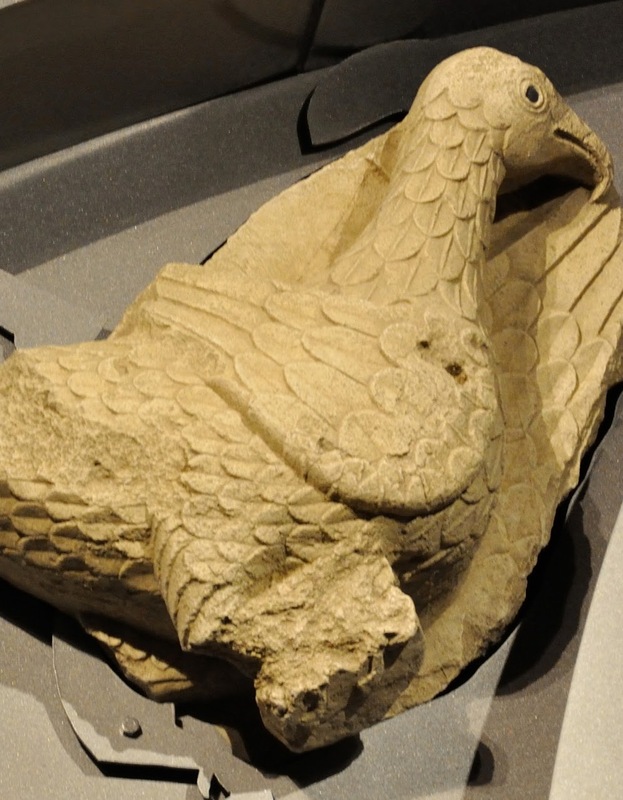 It seemed that Cluny's eagle is a copy, whilst the Louvre houses the original. Wikipedia confirms this, and contains a reference to the inventory of the Louvre. 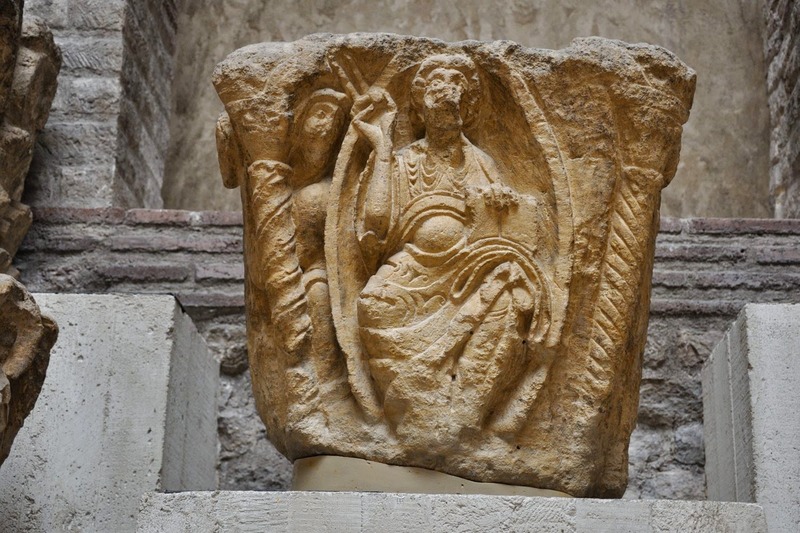 The original of a Saint Peter, high on the left hand side of the portal, can be found in the USA. 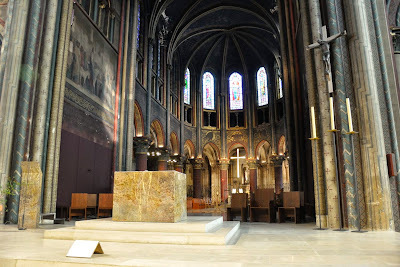 When in Paris recently, we visited the church Saint-Germain-des-Prés for the second time. This time I found a brochure there, saying that the capitals in the nave were copies, whilst those in the choir were still original. The choir is not accessible for visitors, and the distance between transept and the capitals is too big to take free hand pictures, even with flash and fast film setting. Our visit to Paris coincided with the visit to Paris of an Australian Facebook friend from a closed photo group, whom we could finally meet in the flesh. The lady in question takes very nice pictures indeed, hence I popped the question: would she mind trying to photograph the capitals? This was not met with deaf ears, and a month later, after she had returned to Australia, I received a set of photographs. 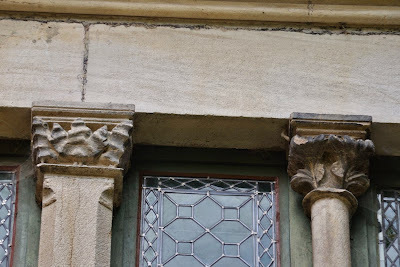 And since I love to share things with others who might be interested I sent a set to Bourgogne Romane, together with another series taken during my visit to the Musée de Cluny in Paris. 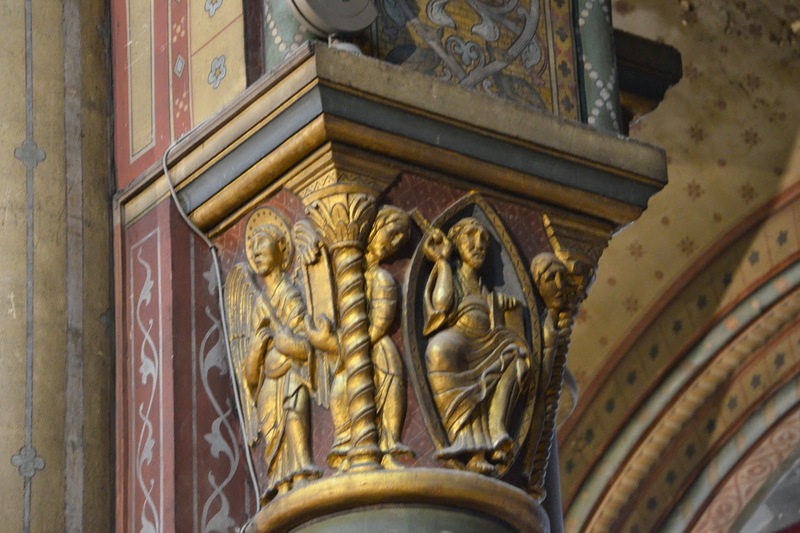 Quickly I received a mail concerning those batches of photos: at least one of the "original" capitals in the choir appeared to be a copy of a real original I had shot in the Musée de Cluny! From which the conclusion may be drawn that not all museum captions are necessarily complete, and also that the brochures one find in churches not necessarily are to be taken for gospel. However, gospel can be found elsewhere in most churches. Long time ago I read on an information panel somewhere in Cluny that, when demolishing a number of mediaeval houses on the Petite Place du Marché between 1860 and 1866, several claire-voies of those houses were saved and are on display in Musée Ochier in Cluny. 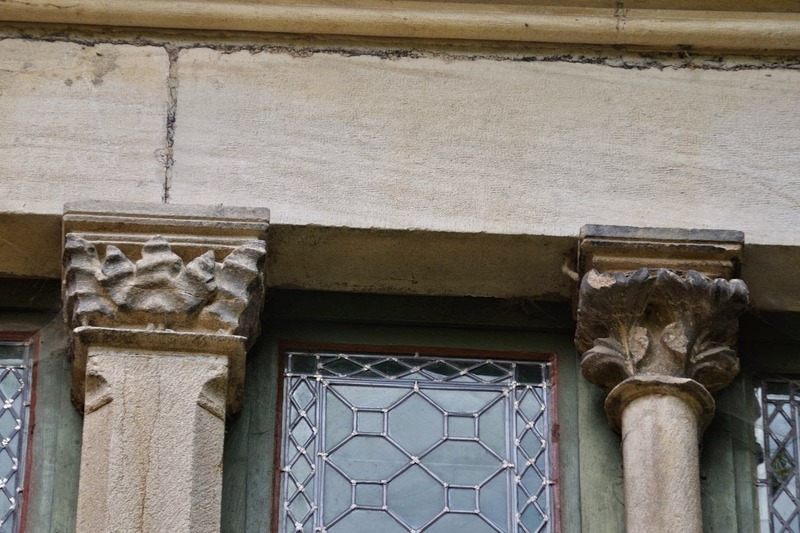 Recently another one was discovered in the façade of the château in Burnand (private property, partially rented out as a B&B). In 2012 we asked the Dutch caretaker of the château (the owners lived at the time on Bali) if we could have a look at the building. However, she was very busy at the time, and asked us to give her a call later that year. 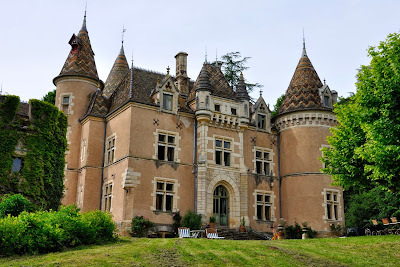 When we bumped into her some month later in Cluny she told us that the owners were divorced, that she had been sacked more or less on the spot, and that one of the owners would move to France and take care of the château herself. That was the end of our potential visit to the château, so we thought. 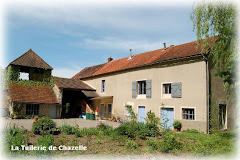 However, the Office de Tourisme in Saint-Gengoux regularly organises excursions along the various B&B's in the area, so maybe that could be our next option. Unfortunately, when Burnand was on the program we were not able to make it. 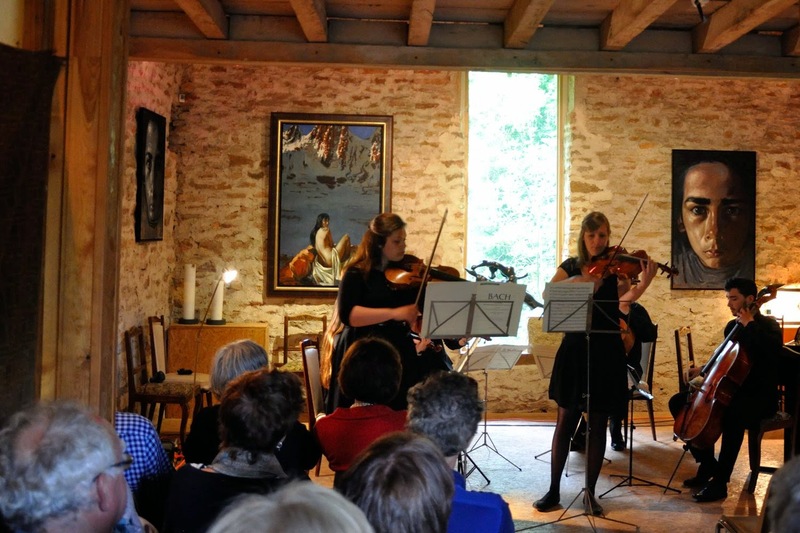 Recently we saw another chance: there was going to be a free concert at the château, which gave us a chance to see this (Gothic) claire-voie from Cluny on the pretext of a cultural outing. And we found it. 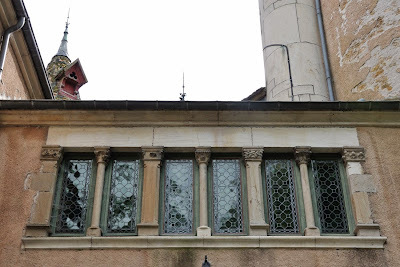 The outside of the château is worth a visit anyway. It is very picturesquely located on the edge of Burnand, a village which hosts an interesting Romanesque church. I can be very brief about the concert: after two minutes we had had enough. I rather pay an entrance fee for a professional group of musicians than listening for over an hour to a dress rehearsal of some not (yet) very good amateurs. That is a privilege I happily grant their family and friends!